(Tech Xplore)—This AI launch could signal a difference for the better. Cambridge, MA-based Gamalon is touting its approach to AI and machine learning and the claims are significant. To start, add this to your mountain of technology acronyms: Bayesian Program Synthesis (BPS). The technology is such that it writes and rewrites its own Bayesian programs. As Ashlee Vance wrote in Bloomberg, "Gamalon's big claim is that its software can adjust its own models, essentially reprogramming itself." 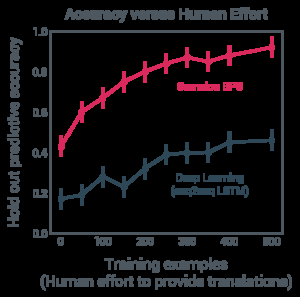 According to Gamalon, the technology uses "orders of magnitude" less computation, less training, and achieves higher accuracy than today's deep machine learning. In support, Gamalon shows a video. In it, they compare the technology with what they describe as "state-of-the-art deep learning" while playing Pictionary: "we draw something, and the system must guess what we drew." They show that the system "learns from only a few examples, not millions. It can learn using a tablet processor, not hundreds of servers." Ashlee Vance said, "Gamalon Machine Intelligence, uses probability models to teach a computer to ID something like a cat in a few minutes by showing it just a few images." "We have one customer that, every year, spent nine months and four million dollars to structure and match their data," said Gamalon's founder and CEO, Ben Vigoda. "In contrast, Gamalon was able to perform the same task in minutes with twice the accuracy." What is this technology about, more specifically? Rick Merritt in EE Times: "Gamalon uses a statistical form of lambda calculus and proprietary algorithms to create associations in text data with virtually no training. It uses Python as an inference engine or solver algorithm, opening a door to easier interactions with programmers." BPS is being commercialized in Gamalon Structure and Gamalon Match. These are two items announced by Gamalon on Tuesday. They referred to this as an "alpha launch" of its first commercial application of this technology. "Gamalon Structure converts streams of text paragraphs found in databases or documents, into clean, structured data rows ready for use in the enterprise. Gamalon Match can then deduplicate/link these data rows," according to the company. Vance explained the idea behind the two, Structure and Match. Vance said they, are "designed to scour common databases and fix ambiguities, like different spellings for customer names and addresses." Case in point: Avaya. Vance wrote about how Avaya makes use of the Gamalon. "To keep its databases effectively searchable, Avaya used to use people to pore through them for months at a time, turning 'St.' into 'Street' or 'HP' into 'Hewlett-Packard'"
How did Avaya fare? Vance quoted Cary Gumbert, senior director. "With Gamalon, we were able to match 85 percent of the data in minutes instead of days." It is not bothersome like the find-and-replace search tools that do not see context, so the software does not turn, say, "St." in "St. Louis" into "Street," Vance said. Vance said that Vigoda was showing its products to the public for the first time. The company said they were now available to "select customers as API's integrated with the Amazon, Microsoft, and Google Cloud platforms." Vigoda said that "Almost every enterprise that we talk to has large quantities of unstructured text data that they are currently unable to use." Vance quoted Brenden Lake, a data science fellow at New York University. "The promise here is that you use data a lot more efficiently." Will Knight in MIT Technology Review also quoted Lake. "Probabilistic programming will make machine learning much easier for researchers and practitioners," Lake says. "It has the potential to take care of the difficult [programming] parts automatically." The picture of Dan's face looks like some of Nadia's(autistic savant) horse drawings. Noise gets into every designed communication channel. It is a feature and a resource. Objectivity gets vague as complexity increases. The comparative analysis of error correction within the heuristics was cool, but the assumption of the entire data set is a big one that favors Bayesianism. The assumption of no a priori favors statistical methods for probable approximate correction. I wonder if you could have it get to the Standard Model and compare rates. Is the discovery of physics reliant on an order to certain fields? Or can you just cram this open source Watson and LHC? Its so strange and humbling that discrete packets mathematically lead to a duality of complexity of coordinates for bosons and handedness for fermions, but then by phase space or factor for the latter. Its just preserving shadows of unit circles or multiplying continuous spherical packing. As though there were an apt spontaneous fracturing of symmetry, yet the fluidity of the frozen river were preserved. In experiment we can just freeze water. Lets machine learn to watch ice freeze with some kind of noninvasive tomography, after we get enough resolution to monitor for meteors with visual recognition. We need a bridge from Facebook data for facial recognition to the starry skies with a scatter infermometer like we need one from PDF to html5 or homotopy and captcha. We will regrow memresistor.